Tablet PC are a new way to use computers, with intuitive gestures achieved for mobile computing. However, responsive pencil, Face ID and all the smart features included in amazing device like iPad Pro, tempt users to replace dektop and laptops with tablet PC, also for home-Computing. Love your iPad as you can see on the video above? Take care how you use it! As convenient as iPads and other tablet computers are, they can cause physical problems because people often peer down at them in their laps. Viewing a computer screen is less stressful on the body when users are seated looking straight at the screen, not from above or below. People use tablet PC in four different positions: in the lap with the tablet held with their hand; in the lap with the tablet resting against its case at the low angle position; on a table against the case at the low angle position and on a table with the case at its high angle position. Only when used on a table at the high angle position, users’ posture approach neutrality a straight-on viewing position. From the other three positions, users look downward at their tablets, at a steeper angle than has generally been reported for laptop or desktop computer users. Over an extended period of time, this is likely to cause stress on neck muscles and other postural problems. Lounge-wood was born for laptops, but in 2014, we have introduced some features to improve the user experience with Tablet and e-Book reader. The cut, allow to use tablet in two modes with different angles, always safety for devices. The second one is 10 ° against the tray board, as a support useful to watch video and multimedia. Are you looking for a cheap but as Smart solution? With Logitech k480 you can transform any tablet or smartphone in laptop, with lounge-book you can use it comfortable, on your favorite place at home. Multi-device keyboard bluetooth k480 by Logitech: the revolutionary keyboard for your computer that also works with your smartphone or tablet. 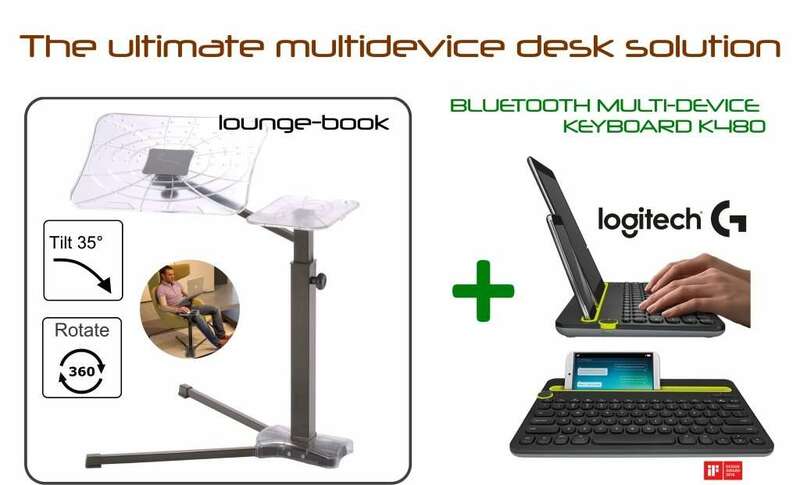 Ergonomic laptop support Lounge-book: the most imited fully adjustable laptop stand that improve ergonomic features of mobile device at home. I recently came across your website lounge-tek.com and found it very interesting.